The wife is always right. I’ve never caught a foul ball. 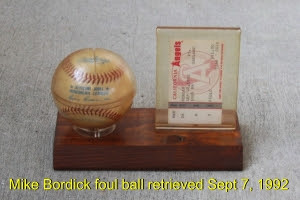 Here’s a photograph of the baseball obviously rubbed by the pitcher in red dirt, and still waiting almost 15 years later for a Mike Bordick autograph. That’s the game ticket next to it. Any readers who know Mike or how to reach him please email me. An autograph would be a great final touch to this momento. If you live in Maine you probably know Mike Bordick, or so some people would think. Please continue. Now on to Mike White. In 1968 I was away and having a casual conversation with a guy in New Jersey. When I mentioned that I was from Maine, he asked “Do you know Mike White?”. Huh? What do people think!!? I was too dumbfounded to speak at first and just froze with eyes glazed over and my mouth wide open. I recovered and replied “no”, and went on to explain the population of Maine is, was, and will probably stay around 1 million. Double that during tourist season and I never met Mike White.